Teaspoons, Jigger, Shaker Classic/Boston, Strainer, Grater, Martini Glass. Combine the Vodka, Chocolate Liqueur, Creme de Cacao and Cherry Preserve in a cocktail Shaker. Fill with ice and shake well to break up the Preserve. 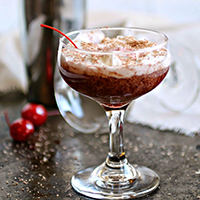 Pour into a chilled Martini Glass and top with Whipped Cream, Shaved Chocolate and a Maraschino Cherry.